Donovan's Journey from Pop Star to Artist The had a string of hits in the mid-1960s, including "Mellow Yellow" and "Sunshine Superman." He now has a new memoir, an art show and a just-released anthology of his music. Alex Chadwick talks with Donovan about his sometimes strange and difficult journey as a '60s pop star. The had a string of hits in the mid-1960s, including "Mellow Yellow" and "Sunshine Superman." He now has a new memoir, an art show and a just-released anthology of his music. Alex Chadwick talks with Donovan about his sometimes strange and difficult journey as a '60s pop star. In the Gavinda Gallery in Washington, DC, an exhibition of photo collages, romantic images of ethereal, beautiful faces inspired, says the artist, by the works of the Greek poet Sappho and by the artist's father. DONOVAN: My father was a photographer, and as a child I used to see the paper slipping about in the white china tray, and out of the paper would come the images. And I thought it was magic. CHADWICK: The exhibition is called Sapphographs, and the artist might look familiar to someone who lived through the 1960s when this artist was sometimes known as the "Hurdy Gurdy Man." CHADWICK: The artist and the man singing this song is Donovan Philips Leitch, known simply as Donovan. He had a string of hits during the swinging London days of the '60s, and his story began when he left school in his native Glasgow, Scotland, to bum across Europe with a friend. DONOVAN: Gypsy Dave and I in 1962 stuck our thumbs out and we became vagabonds, two rambling boys at the age of 16 and 17. DONOVAN: (Singing) We stood in the windy city, the gypsy boy and I.
CHADWICK: Influenced by the Bohemians and the beat poets and Woody Guthrie, Donovan and Gypsy Dave traveled and wrote songs and sang them to anyone who'd listen. 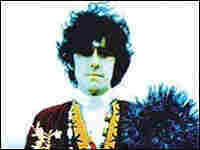 They became fixtures on the British folk music scene, and in 1964 Donovan recorded his first album. And I was part and I was a voice, and I was creating the works. Bo-boom. Art and commerce collided. DONOVAN: Losses started pouring down upon me. Management started arguing. Record companies started pulling one of my legs; another record company started pulling another. And in the ensuing battles, "Sunshine Superman," the album that I was making at the end of 1965 and early '66, was held up in the courts. I'd already made the masterwork. It was done. It was sitting on the shelves, an extraordinary experiment and exploration well before "Pet Sounds" and "Sgt. Pepper." And I knew what I had, and Mickey Most, my record producer, knew also. And he also said aside often to me, `Look, the record's not coming out, but don't play it to McCartney. And, of course, I played it to The Beatles. One wants to play to one's peers. And then in 1966, in the middle of the year, I'm the first one to be busted. CHADWICK: Donovan was arrested and charged with possession of marijuana. DONOVAN: So the record's held up in the courts. One year after Gypsy Dave and I just arrived, it looks like it's all over. Nobody will talk to us; only George Harrison calls Gyp and I up. `Are you all right?' `Yeah.' `You've been victimized, haven't you?' Said, `Yeah.' `What are you going to do?' `We're going to go to a deserted island until it all blows over.' And George says, `It'll never blow over, Don. We'll be next.' But it looked like the career was over, and Gypsy and I were leaving again. Where we will go? Where else? Greece. CHADWICK: So Donovan and Gypsy Dave made their way through the ancient islands of Greece, living again on pennies and songs. CHADWICK: That was the good news. The bad was they didn't have enough money to get off the island. CHADWICK: Donovan and Gypsy Dave got their tickets to Athens, and Donovan went on to record hits like "Mellow Yellow," "Wear Your Love Like Heaven" and "First There is a Mountain." DONOVAN: (singing) That's right. First, there is a mountain, then there is no mountain, then there is. First, there is a mountain, then there is no mountain, then there is. CHADWICK: He's continued singing and writing songs, though never with quite the success of his earliest work, and after 40 years in the business, now he has an art show and a memoir out this year, the autobiography "Hurdy Gurdy Man" and from Sony a newly released boxed anthology of his music. It's called "Try and Catch the Wind." 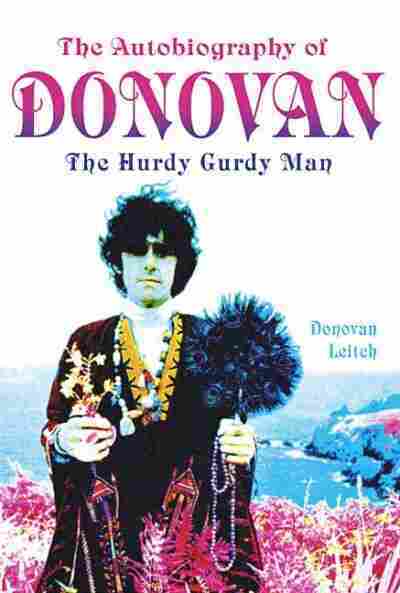 And there's something else, too, a renewed respect for Donovan, based at least in part on an admiration for someone who lived through and survived the dangerous role of pop star at the dawn of the Age of Aquarius. Did it seem like it was going to go on forever, or were you aware that this was just a moment? DONOVAN: No, you don't think what's going to happen next Tuesday, do you? Next Tuesday doesn't exist. You know, and actually when you're in the work, there is no time. Of course you have to wake up and maybe there's a bill to pay or a lawsuit at the door. But when you're in the work, no, time doesn't exist. So that's in answer to your question: Did we sit around and say will this go on forever? There was no forever. There was only now. And there is only now actually. Music and art arrests time. It stops time, so all these extraordinary things I've learned and continue to express can be the ramblings of a romantic poet. Well, they are the ramblings of a romantic poet, but there's a lot of art and artifice and a lot of effort and skill in what I've done. And the most beautiful piece of work is so effortless, you don't know how much work has gone into it. And one guy from theater told me you see the swan moving sedately over the lake. What you don't see is under the water the webbed feet doing like this (demonstrates). DONOVAN: Knowing her fate, Atlantis sent out ships to all corners of the Earth. Onboard were the 12: the poet, the physician, the farmer, the scientist, the magician and the other so-called gods of our legends. Though gods they were and as the elders of our time choose to remain blind, let us rejoice and let us sing and dance and ring in the new. Hail, Atlantis. CHADWICK: Donovan's exhibition Sapphographs is at the Gavinda Gallery in Washington, DC, through the first week of November. I'm Alex Chadwick. There's more DAY TO DAY just ahead from NPR News.